I'm thinking about it, though I'm still not 100% sure. If I do go which is now looking around Monday night instead of tonight (assuming KSC is NO-GO tonight & tomorrow) I heard there is a nice viewing spot on Highway 58 @ 20 Mule Team Rd. There is a video on Youtube of a crowd of people there and they seemed to get a good view of it. I also saw some photos from approx the same location and that person was able to view touchdown (you could see the puffs of smoke from the Main Gear). I'll look for the videos & photos and post them if I can find them. Yeah I've been considering holding off as well, but I think I'm going to go anyway. I saw 130 lift off, and I would be bummed if weather cleared at Edwards and I missed an op to see launch and landing of a single mission. I'll stick around for Monday night if it doesn't land tonight though. I was wondering about locations on-base actually, I'm not sure why I didn't clarify that. That's interesting though, I didn't realize you could see touchdown from there. Is anyone heading to Edwards tomorrow night? Just curious about when others are planning to be out there and where they are viewing from. If you do go out on Monday and Endeavour is still on-orbit, keep an eye on the wind direction, which may drive which end of the runway the orbiter would land on. The 20 Mule Team Road site is great for approaches to Runway 22, but for the other end (Runway 04), you'd likely want to be on the south side of the base. That's true, I forgot to mention that thanks. So far and I know this is WAY early, but I think the ground tracks have it on 22, but that is subject to change before landing. I'm not sure of any good sites to the South with the exception of the Rogers Public viewing site which they rarely open. All I can say is the anticipation for this one is exciting! Unless you know someone that works on base forget about getting on base. It is almost impossible to get on base for a shuttle landing (press etc.. excluded) I have a couple of friends that are part of the VIP group at Edwards and the closest they got was at the North part of the base, about 5 miles away. You'd have better chances at 20 Mule Team Rd. If in fact they target for 22. Both have videos and are different perspectives. I don't know anyone that works on base, but I was able to get on base for STS-128 landing, viewing, and ferry flight takeoff with a military ID. I guess it hadn't occurred to me that things might be different for this landing - any more info? I'm not familiar with the VIP group you mention. For 128 I didn't know exactly where to go and I ended up blowing my best opportunity, because the roads around south base were shut down an hour or more prior to landing. I drove past the road and burned a little too much time talking with some airmen I had asked for directions, and when I came back it was closed down. I ended up about 3.5 miles north of the strip on a hilltop with a handful of other folks, and while it was a great view I was hoping to be a little more prepared this time! If anyone has any advice I'm all ears . Oh OK , I didn't know you were in the Military. Yeah with a Military ID it's no problem, but for us civilians we have no hope, lol. As for the VIP group I don't have a lot of info, I just know a guy who is retired Air Force and him and his wife were explaining it to me. To get into it though I was told I would have to go through security screening etc... Still pondering it though, sounds pretty neat. Anyhow cool that you got to see 128 land from so close!! Welcome home, Endeavour! It was truly a magical 2 weeks as I watched it take off from Titusville, followed its progress in space, and watched it land this evening from my computer back home in Texas. I find the whole space program so wonderful, and am so sad that these will soon stop flying. Glad I took the time and was able to at least see it take off and share with my kids. We'll see you in July for your final trip, Endeavour. Based on our experience and what I have heard from other on this forum is that NASA's makes there call about month prior to launch date. My guess is you will not hear anything till the latter part of June. You might try and confirm with your congress person that NASA has you on thier waiting list. Here's how it happened for us with STS-130. Right after Thanksgiving my wife asked what I wanted for Christmas. I told her I wanted to go to Florida and see STS-130 take off. She asked me how to go about getting tickets. I told her we could try and buy them online or go through our congressman. She opted to try the congressman route first. She emailed my congressman's (Dennis Moore D-KS) chief of staff on 12/2/09 (T-68 days) and asked about getting tickets. He emailed back the next day saying he would be glad to help out and asked how many wanted to go. He said he would let us know when he heard something. On 12/10/09 (T-60 days), Moore's office emailed back and confirmed that Nasa had us on thier waiting list. They also forwarded me the email they received from the NASA congressional contact. Text of that email is below. Thanks for sending this. Requests are taken on a first-come, first-serve basis, and I will inform you as to whether or not the passes can be granted about a month prior to the scheduled launch. If they are granted, an invitation is mailed directly to the home mailing address that is good for everyone in the party. Due to the overwhelming amount of requests NASA has received for the remaining space shuttle launches, we have recently implemented new guidelines regarding requests. There is now a limit of five (5) people per party. We can make the exception for the infant, but we normally try and stick to this policy. Also, we don't require social security numbers or dates of birth, but knowing the ages of the guests is helpful. FL (the launch has recently been rescheduled from February 4th). invitation to RSVP directly to NASA. 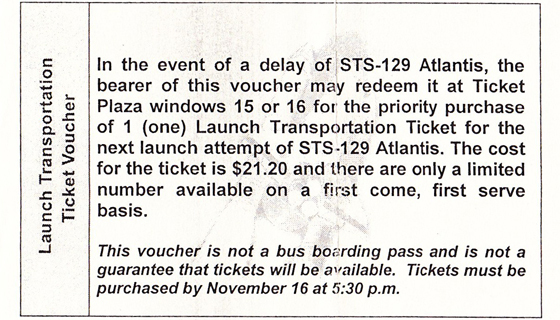 "Tickets" were received from NASA on 1/12/10 (T-27 days). The rest is history. I hope this helps. Now this mission is all wrapped up I would really appreciate hearing peoples experience at causeway ticket purchases and also with re-purchasing after the -9 min scrub. Hoping to get over for STS-132 but I hear since my last launch they have changed the purchase proceedure somewhat. I think the High Res images I took that day can be seen in L2.